Get heavy-duty, low-cost printing with the WorkForce Pro WF-5690 multifunction printer. Powered by Epson's new PrecisionCoreTM printing technology, the WF-5690 delivers Performance Beyond LaserTM, producing professional-quality prints at fast speeds. Save on printing up to 50 percent lower printing cost vs. color laser1. Get reliable, low-maintenance, high-volume color printing with a 45,000-page monthly duty cycle2, ultra high-yield cartridges and large paper capacity. 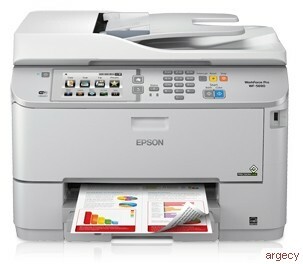 Includes auto 2-sided printing, copying, scanning and faxing. Easy workgroup networking and administration with setup and security features for wired and wireless3 connections. Also includes PCL and PostScript support4 and three-year limited warranty. Print wirelessly from your iPad, iPhone, tablet, smartphone or computer. One-sided ISO print speeds of 20 ISO ppm black and color. Easily connect and share with others in your workgroup using a wireless or wired network. Three-year limited warranty in the U.S. and Canada. Maximum Paper Size: User definable up to 8.5" x 47.2"
5 Wi-Fi CERTIFIEDTM; level of performance subject to the range of the router being used. Wi-Fi Direct may require printer software. 8 Only printing is supported under Windows Server OS. 9 Not all media types are supported for PCL printing. 10 Monthly duty cycle up to 45,000 is the highest duty a user could expect in a month, based on near-constant operation of a device of this kind. It is not recommended that the device be run at this duty. For best device performance, run the device at the recommended duty of 2500 pages per month.